Montessori therapist Bianca Mattern succeeded in her endeavor of inspiring seniors as well as teens to work together as a team in implementing the project “traditional friendship book“. It sure wasn´t easy overcoming each sides´ inhibitions: seniors of the Senior Citizen Residence being afraid of misbehaving, loud kids and teens of the Montessori school in Passau expecting introverted and simple-minded seniors. Both sides´ worries however, didn´t come true and what emerged was a wonderful and nostalgic poetry book. Excerpts of the friendship book entries were enlarged and displayed in the “cross-generational” exhibition in the Senior Citizen Residence, Neustift. Six years ago Bianca Mattern used to work for the nursing home as an advisor for seniors living in the “assisted living” section of the facility. 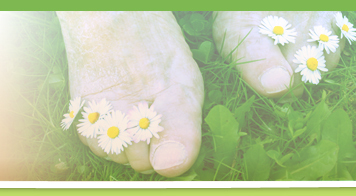 Along the way she finalized her formal training and became a Montessori therapist. It was the combination of her profession at the time and the formal training that inspired her to use Maria Montessori´s principles not only in the work with children, but seniors. The positive experiences that came along with this new approach were retained on paper in her first book “Montessori for Seniors”. Mrs. Mattern then decided to open up her own private Montessori practice, focusing only on the work with seniors. Today she offers her services predominantly in the district of Passau, where she is coaching and helping seniors not only in nursing homes, but their own apartments. Besides this she is volunteering at the Montessori school of Passau, giving lectures Germany wide. Internationally she is by now being booked by Austrian and Italian facilities and her contacts reach as far as Japan. 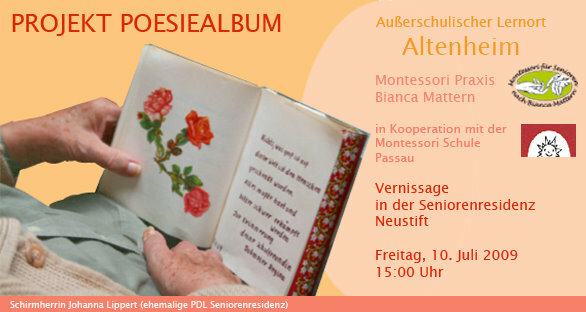 At the exhibition opening of “cross-generational friendship book” the host facility, the Senior Citizen Residence Passau Neustift, was booked to the last seat. The interest was especially big amongst the seniors themselves. In a very friendly and almost family-like atmosphere the manager of nursing services, Mrs. Ulrike Weber, welcomed the guests and Ms. Mattern. Remarks of the exhibition´s patron, Mrs. Johanna Lippert were followed by the laudation of Mr. Swen Staack, chairman of the Alzheimer Foundation Schleswig-Holstein. Mrs. Mattern herself thanked seniors as well as teens for their participation. An employee of Mrs. Mattern, Nathalia Svirina was in charge of the background music. A short reception merged into the cozy and informal part of the event. The exhibition can be seen until the End of October 2009.